Absorber— The surface in a solar (thermal) collector that absorbs solar radiation and converts it to heat energy; generally, matte black surfaces are good absorbers and emitters of heat while white and metallic surfaces are not. The best coating of all is known as "black chrome," a specialized wavelength selective surface that converts nearly all the radiation striking it and emits very little as heat from that coating. Absorptance-- The ratio of energy absorbed by a surface to the energy striking it. Active System-- A solar heating system that requires external mechanical power to move the collected heat to/from storage or living spaces. Air Changes per Hour--	The rate at which the volume of air in a home changes; the number of air changes per hour can vary from as low as .35 to as high as 4 or 5 if excessive infiltration is present. Air-to-Air Heat Exchanger--	(With fan) [Also called an HRV, Heat Recovery Ventilator] A mechanical device used to maintain sufficient good quality air within a structure yet minimize added energy costs. This is accomplished by exposing incoming and outgoing air streams to each other's thermal characteristics through a heat exchanger (without mixing the air masses directly). Fresh air from outside and outgoing stale air from inside cross paths on the way to their destinations. Each influences the other thermally, so that incoming summer air is not as hot and incoming winter air is not as cold. This is more efficient than opening a window, and the unit can be manually or timer-controlled to put fresh air into the house when desired. Closed windows in summer months may increase building security. Ambient Temperature-- The temperature of surrounding outside air. Also OAT (outside air temperature). ASHRAE-- The abbreviation for the American Society of Heating, Refrigerating and Air-Conditioning Engineers. Auxiliary Heat-- The extra heat provided by a conventional heating system for (periods of cloudiness or intense cold) when a solar heating system cannot provide enough. Also, as a condition in heat pumps when the rate of heat production cannot satisfy a thermostat call. At such times, electrical resistance "strip" heaters boost the temperature of the ducted airflow. 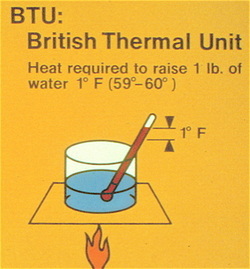 British Thermal Units--	Thermal measuring system based on the amount of heat necessary to raise one pound of water one degree Fahrenheit. The BTU is the common scale to measure heat in the U.S. It is estimated to be the same amount of energy as the burning of one wooden match. Closed Loop--	Any loop in the system that is not exposed to the atmosphere. Coefficient of Performance (COP)--	A heat pump efficiency comparison that shows how many BTU's are delivered per kilowatthour compared to that heat generated by a kilowatthour of electrical resistance heating. Air-to-air heat pumps can top a COP of 3.0. Ground source heat pumps can reach 5.0. That's three and five times the heat delivered per kilowatthour of resistance. Collector-- A device which collects solar radiation and converts it to heat or electric energy (depending on its surface composition and construction). Collector Tilt-- The angle in degrees between the horizontal plane and the inclined surface of the solar collector plane. Combustion--	The act or process of burning, (rapid oxidation), accompanied by heat and usually light. Combustion Efficiency--	The ratio of the amount of heat available as a result of the combustion process, compared to the amount of heat potentially available from that fuel in an ideal process; it is expressed as a percentage. Condensation--	The process of changing a vapor to a liquid by extracting heat from the vapor. 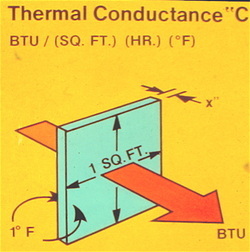 Conductance-- The rate of heat flow (in BTUs per hour) through an object when a 1°F temperature difference is maintained on both sides of the object. Degree Day--	The number of degrees difference from 65°F each day, whether above (Cooling DD) or below (Heating DD); the days are added together for the entire heating or cooling season. Barrow, AK is near 20,000 for the winter. Minneapolis, MN is near 10,000, and the Sacramento, CA area is near 2700. Cooling DD in Sacramento are 1237. In Las Vegas, NV Cooling DD are 3200. Dew point temperature--	The temperature at which condensation starts to form for a given humidity and pressure. This temperature corresponds to air saturation (100% relative humidity). The eastern U.S. summer poses discomfort outdoors from high dewpoints. This occurs because body cooling though micro or macro perspiration will not evaporate as quickly off the skin as in conditions of low humidity. In the western U.S., particularly in the Great Basin (centered around Nevada) the lowest humidities are found. Dry air evaporates perspiration quickly, lowering our skin's temperature. Low dew points also explain why swamp coolers work so well in the west with their evaporative cooling. Efficacy (lighting)--	The lighting power of a particular luminaire per watt of electricity consumed. High efficacy means efficient lighting. Energy Audit--	A service that analyzes energy consumption in a building, the practicality of retrofit measures, and the payback time for such investments. Energy efficiency ratio (EER)--	The ratio of useable output to input of energy; in the case of cooling units, since the input is usually electrical power (measureable in watts); and the amount of heat removed is measureable in BTU's. The EER is the ratio of the number of BTU's per hour to the number of watts used. Envelope--	The protective shell of a building which separates the outside environment from the inside environment. Fahrenheit--	A temperature scale at which water freezes at 32° and boils at 212°. Fixture (lighting)--	The device which anchors and provides power to a luminaire so that it can generate light to living space. Girder--	A large beam which supports floor joists or the framework of a building. Galvanic Corrosion-- The condition caused as a result of a conducting liquid making contact with two different metals which are not properly isolated physically and/or electrically. Ground Loop--	A closed loop, underground fluid system employed in ground source heat pumps to gather heat from vertical boreholes or horizontal layouts of high density polyethylene pipe. BTU's are extracted from the ground to vaporize refrigerant (or condense it) in heating and cooling. Engineering to match the amount of pipe and ground surface contact with a building's heating/cooling load is essential. Ground Source Heat Pump (GSHP)-- A heat pump unlike an air-to-air model, in that it does not have an outside compressor in combination with its condenser / evaporator. Instead, the exchange of heat from and to a source / sink is from the ground, water on/in the ground, or by vertical bores, hundreds of feet, underground. More is found on this site's ground source heat pump page. Header-- The pipe that runs across the edge of an array of solar collectors (or ground loop bores and trenches in ground source heat pumps) that supply and return fluid to a central collection point. In this case not to be confused with a horizontal, load-bearing wood framing member in common construction. ALSO: The expression of how many BTU/hr can be provided by a heat pump in the heating mode. Heat Storage-- A device or medium that absorbs collected solar heat and stores it for use during periods of inclement or cold weather (or night time). Liquids in insulated tanks, thermal mass inside living space or in adjacent insulated porous masonry or rock, or phase-change materials all qualify. Heat Exchanger-- Any device which transfers heat from one medium to another when they are not in direct contact with each other. The transfer can be between gases, liquids, or any combination of the two. Hybrid Solar Energy System-- A thermal solar heating system that uses both active and passive methods. Infiltration--	Movement of air into and out of a building through intended and/or unintened openings in the envelope. Insolation-- The total amount of solar radiation—direct, diffused, and reflected—striking a surface exposed to the sky. Insulation-- A material with a high resistance (R-value) to heat flow. Joist--	Any beam parallel to the ground that supports a floor or ceiling. Kilowatt (KW)-- A measure of power equal to one thousand watts; approximately 1.33 horsepower, and usually applied to the medium of electricity. Kilowatt-hour (kwh)-- The amount of energy equivalent to 1 kilowatt of power being used for one hour. It is the standard unit measure for electrical meter devices for U.S. electric utilities. Also, an amount of heat in BTUs, equalling 3,413 BTU. Life Cycle Cost—	The total cost of installed equipment for HVAC and all the fuel or electric energy it would consume over it's useful life. Inexpensive first cost often masks higher LCC overall. In rising fuel prices, LCC is particularly important when choosing HVAC equipment. Lumen—	A measurement of light output, compared to that of one candle's power. Lumens per watt of electricity expresses the efficacy of a particular light source. Luminaire (or Lamp)--	The bulb, tube, or other device which electricity passes through to create and deliver light to living space. Open Loop--	Some part of the system is vented to the atmosphere, or the system contains fresh or changeable water. Passive Infrared Sensor (PIR)--An electronic device measuring IR light from objects in its field of view. Used often in motion detector technology. The difference in IR temperature "signature" of a moving object compared to its background triggers the device. Passive (solar) System-- An assembly of natural and architectural components which convert solar energy into usable or storable thermal energy (heat) without any mechanical power. Percent Possible Sunshine-- The percentage of daytime hours during which there is enough direct solar radiation to cast a shadow against the ground. Solar heating systems have a greater capture percentage in summer and fall than they do in winter and spring. U.S. regional climatology varies dramatically on this phenomenon. Radiation—	Movement of heat by electromagnetic waves or infrared waves. Rafter--	Any of the beams in a pitched roof that slope from the ridge of a roof to the eaves and serve to support the roof. Refrigerant-- A liquid such as Freon that is used in cooling devices to absorb heat from surrounding air or liquids. It's made in various versions for refrigerators, car air conditioners, and heat pump HVAC units, and its great benefit is that it changes its composition (phase change) from gas to liquid at temperatures and pressures conducive to the equipment in which it resides. Modern heating/cooling/refrigeration would be non-existent without it. Relative Humidity--	The ratio of the amount of water vapor in the air to the amount it could potentially hold at the same temperature. As can be seen, after the day is pretty much finished the humidity in the eastern U.S. exhibits its pattern of high moisture and the western U.S. its typical aridity. 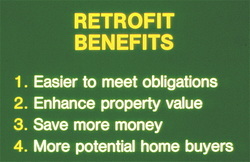 Retrofit--	The process of increasing the energy efficiency of a building. There are a variety of benefits beyond just an increase in one's thermal comfort. Ridge Vent--	Any vent at the top of a roof's ridge line. Usually built as a "continuous" vent along the ridge line. This exhausts convectively-driven hot or moist air in attic spaces when soffit vents below can introduce fresh, cooler outside air. R-value--	Measurement of the resistance capacity of a material or assembly of materials to slow the passage of heat through itself when a temperature difference exists on either side of it. It happens to be the reciprocal of the U-value. Shading Coefficient-- The ratio of the solar heat gain through a specific glazing system to the total solar gain through a single layer of clear, double-strength. In glazing industry parlance (today) this is referred to as SHGC: Solar heat gain coefficient. A SHGC rating of .47 on a window assembly would mean that in direct sunlight, less than half the energy that would penetrate single-paned glass would make it into your house. While .47 is strategic in hot and desert climates, your SHGC preference for a high altitude mountain residence in a cold climate might be closer to .80. Soffit Vent--	An opening between rafter tails at the top of a wall or along boxed, horizontal surface between wall and eave where air can enter the attic. Specific Heat-- The quantity of heat, in BTU needed to raise the temperature of one pound of a material by 1°F. Stud--	A vertical wooden member used in framing walls. Saturation--	Having absorbed all that can be taken up, i.e., the point at which the air has reached 100% relative humidity and can hold no more water vapor. 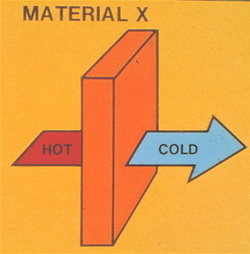 Thermal Conduction--	The movement of heat from molecule to adjacent molecule, through a substance or from one substance to another in contact with it. Thermal Convection--	The circulation of heat within a gas or liquid due to the differences in density resulting from temperature changes. Thermal Window--	A window system with an improved thermal performance through the use of multiple panes, more airtight construction, use of inert gas between panes, and insulated frames and sash. Thermistor-- A sensing device which changes its (measurable) electrical resistance according to temperature. Used in thermostats and temperature data collection to control pumps, fans, and other devices. The WEL (Web Energy Logger) system featured on this site's ground source heat pump section uses many thermistor-based temperature sensing devices. Thermosiphon-- The process that makes water circulate automatically between a warm collector and a cooler storage tank above it. This is also known as gravity convection. Cooler, denser molecules fall downward by gravity and warmer, less dense molecules are displaced upward, against gravity. Active, liquid solar systems and passive, vented Trombe walls exhibit this phenomenon. Ton (cooling or heating)-- A quantity of energy equivalent to that necessary to melt a ton of ice at a 32°F temperature (approximately 12,000 BTU's). Heat pumps are commonly rated in tons of capacity. Nominally, residential heat pump capacities range from 2 -to- 6 tons. Commercial units go to 10 tons. Use--	The way the home is used by residents in terms of their behaviors and energy consumption. U-Value--	Measurement of the conductive capacity of a material to transmit heat in BTUs per square foot, per hour. This is the reciprocal of the R-value. Vapor Barrier--	A moisture impervious layer applied to the surface enclosing a humid space to prevent moisture penetration. and probable future rot of the inside wall elements. A proper vapor barrier keeps winter moisture inside where it belongs, and the insulation dry. It also protects against rot. Ventilation--	The process of supplying or removing air by natural or mechanical means to or from any space. Weatherstripping--	Narrow strips of material place over or in movable joints of windows and doors to reduce the passage of air and moisture. Zero Net Energy--	(ZNE) A term currently suffering from a number of varied definitions across the country, depending upon who you ask and what their orientation is. The Martin Energetics preferred version is that ZNE means that all electrical and thermal loads to satisfy a building (on an average annual basis) are generated on the site/grounds of that building. That means local on-site renewables. They are likely to be solar PV, solar thermal, ground source heat pumps, burned biomass from on-site, or wind turbine electric. The point is that they are all renewable, net carbon free, and use the electric grid only as a battery-like, seasonal balancing mechanism.